Have you heard the news? 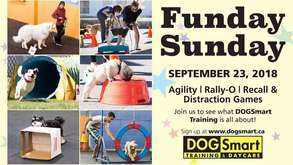 We’re having a Funday Sunday at DOGSmart Training September 23rd! It’s going to be an amazing day of Agility, Rally-O, recall games, distraction work and all kinds of fun. The cost is $25.00 (includes tax and popcorn). More details to come so stay tuned. Mark your calendars! !